As mentioned earlier, the limited mobility and protection provided by the open top half-track vehicles was recognized long before the end of World War II. in the Fall of 1944, a design study at the Office, Chief of Ordnance-Detroit proposed the development of a new vehicle to solve this problem based upon the power train and suspension components of the light tank M24. OCM 25696, dated 9 November 1944, approved the development and assigned the designation armored utility vehicle T13. It also was proposed to adapt the new vehicle to a variety of roles. These were an armored personnel carrier, an armored reconnaissance vehicle, an armored cargo carrier, and an armored prime mover. 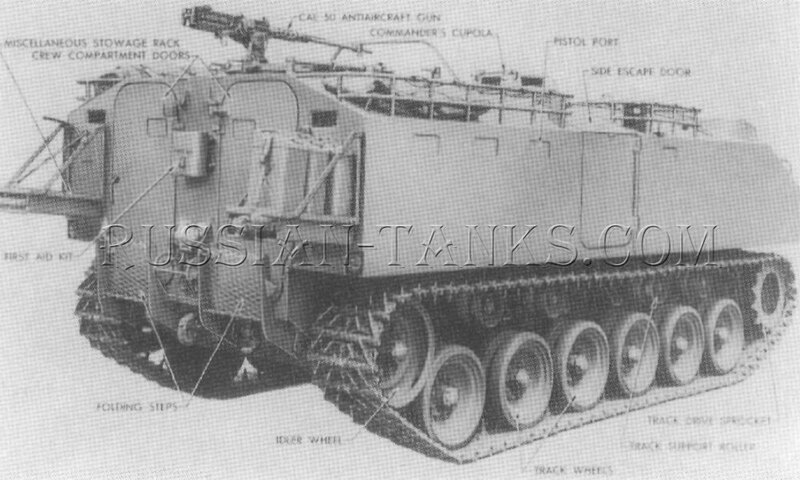 As originally proposed, the T13 carried 18 or 22 men depending upon the internal arrangement. This compared to the 13 men in the half-track carrier which consisted of a driver and a 12 man infantry squad. Thus the capacity of the new vehicle did not correspond to the tactical units that it might be expected to carry. With an estimated combat weight of 39,000 pounds, the T13 was driven by the standard power pack from the M24 light tank consisting of two Cadillac V-8 engines with Hydramatic transmissions. The estimated maximum road speed was 35 miles per hour with a cruising range of about 250 miles. This design introduced the covered box-like hull that was to be characteristic of postwar armored personnel carriers. The driver and assistant driver were seated in the front on the left and right respectively. A .50 caliber machine gun on a ring mount over the assistant driver's hatch provided the only armament. Steel armor, 1/2 inch thick, was proposed for all surfaces. 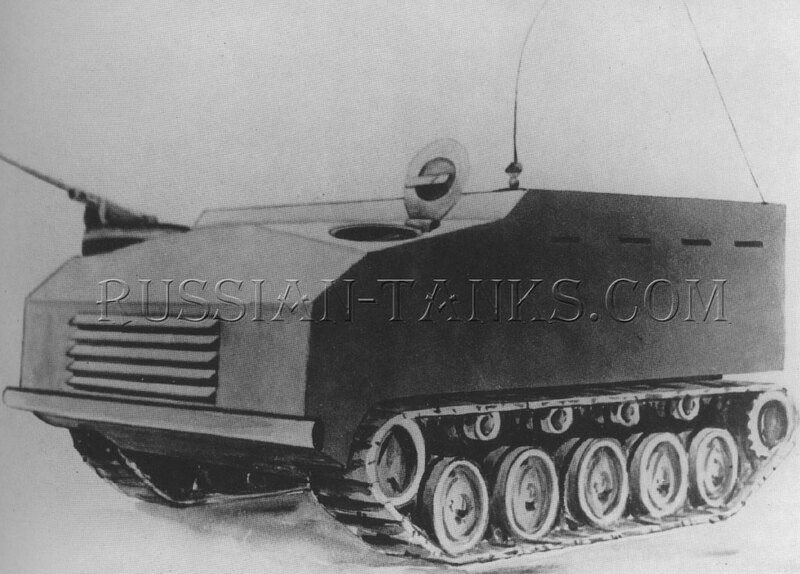 An unarmored cargo tractor version of the T13 designated as the T33 also was proposed. Further studies indicated that the M24 power plant was inadequate for this projected cargo tractor. As a result, the T13 project was terminated by OCM 27033 on 22 March 1945 and the development of a new vehicle was recommended utilizing the power train of the 76mm gun motor carriage Ml 8. This action was approved by OCM 27227, dated 5 April 1945, which assigned the new designation armored utility vehicle T16. At this time, it was planned to use the T16 as the basis for the 4.2 inch mortar carrier T35. However, because of delays in the design and production program, the T35 was canceled in favor of the 4.2 inch mortar carrier T38 based upon the 105mm howitzer motor carriage M37. 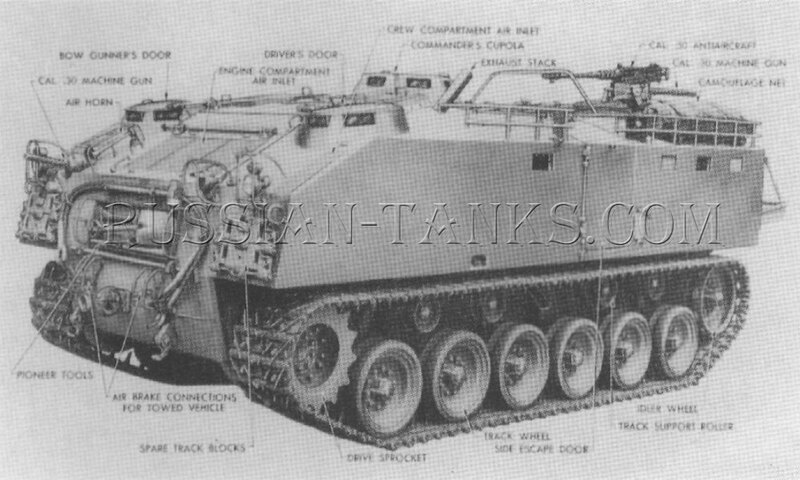 The armored utility vehicle T16 was an even larger vehicle than the T13 with an overall length exceeding 20 feet. It now carried a crew of 27 consisting of the commander, driver, bow gunner, and 24 men in the personnel (carriers) compartment. The welded hull was assembled from rolled steel armor ranging in thickness from 5/8 inches on the front to 1/4 inch on the bottom of the sponsons. The driver and bow gunner rode in the front hull on the left and right of the engine compartment. The vehicle commander was located under a cupola on the roof just behind the engine compartment. 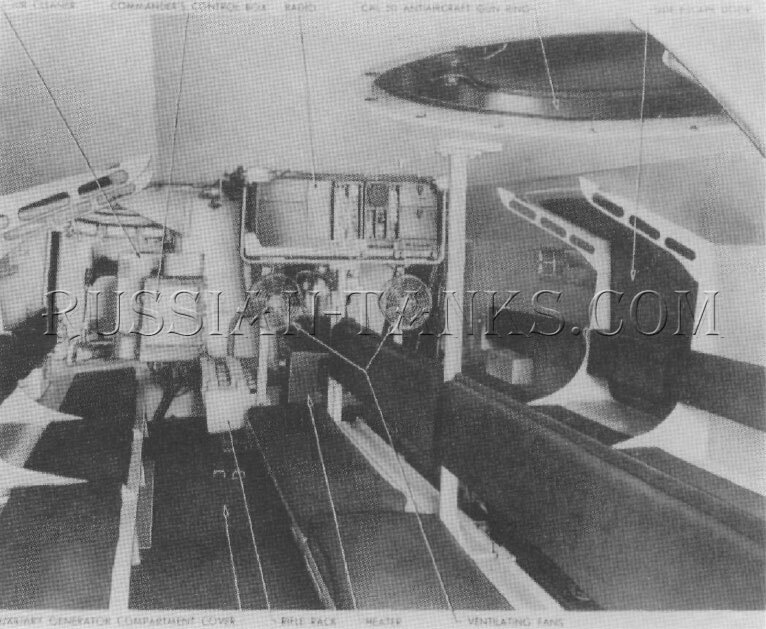 Seats for 24 men were provided on four benches mounted in the center and along each side of the personnel (carriers) compartment. A hatch with a .50 caliber machine gun on a T107 mount was installed on the rear of the hull roof. 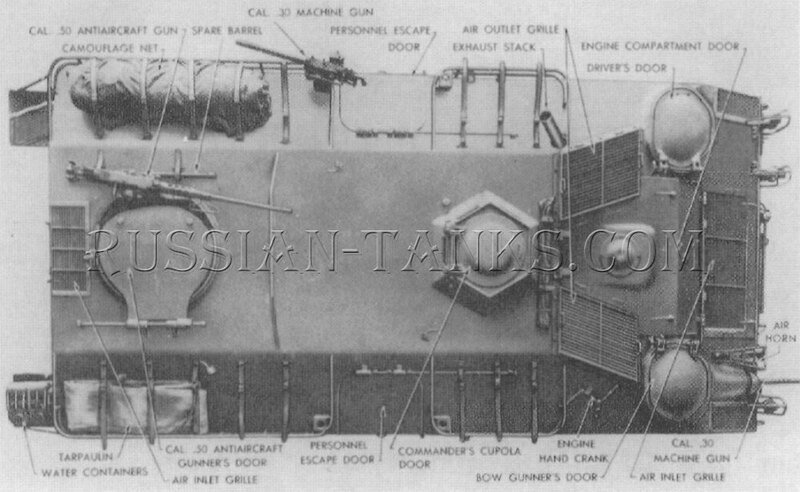 The bow gunner's .30 caliber machine gun could be relocated o any one of four socket mounts next to the two side escape doors. The upper half of these doors opened up and the lower half opened out. Four pistol ports with sliding covers were on each side of the hull. Two large doors in the rear permitted rapid exit from the vehicle. Each door had a pistol port with a sliding cover. A fixed periscope was located in the rear wall outboard of each rear door. The driver and bow gunner each had three periscopes to the front and sides of their hatches. The commander's cupola was fitted with six periscopes for all round vision. 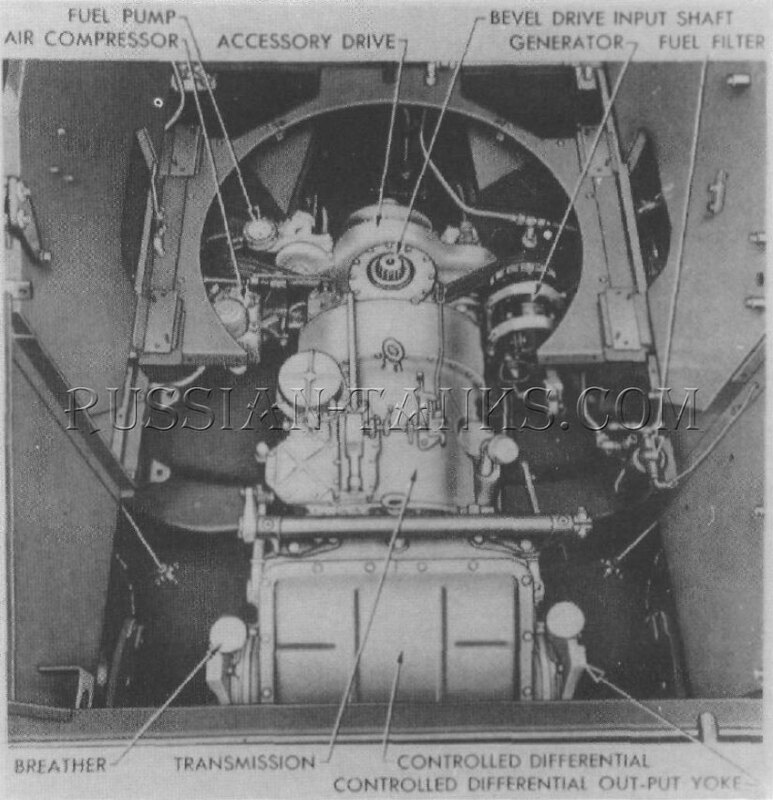 The air-cooled Continental R-975-D4 radial engine was mounted in the center front hull of the T16 with the crankshaft vertical. It drove the vehicle through a bevel gear, a 900AD combined torque converter and transmission, a controlled differential, and two final drives and sprockets mounted at the front. The torsion bar suspension supported the T16 on six dual road wheels per side with 21 inch wide, single pin, tracks. An adjustable idler was at the rear of each track. Shock absorbers were fitted on the first two and last two road wheel arms on each side. 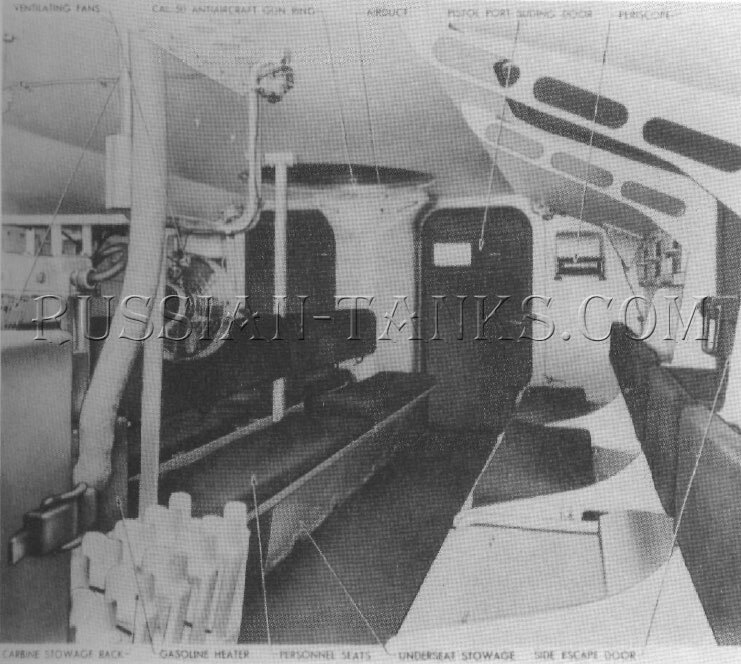 The fuel tanks, batteries, oil coolers, and auxiliary generator were located in the hull beneath the personnel compartment (U.S. Army).